First, click here. This article (originally written by Rich Pelley in Your Sinclair and expanded by various members of comp.sys.sinclair) tells you everything you need to know about how to design your game. But how do you go about putting it all together? Then there’s Basin, a development tool for the Speccy which includes (amongst many other things) an assembler, so you can wow people with your lack of Z80 coding knowledge; and some rather nifty graphics tools – perfect for those awful 8×8 UDGs you’ll be designing! Want to design a game without bothering with all the boring “LET a$=INKEY$” programmy bits? Try Arcade Game Designer or Classic Game Designer. Or just hack somebody else’s game using one of the utilities on WoS (scroll down a bit). Just try to remember that actual good, playable games are strongly discouraged in this competition. Every Crap Game Deserves Audio, as your music teacher would have said. Beepola is a fantastic program which allows you to produce anything from a tiny little tune to play in between levels, to a 9-minute beeper remix of Bohemian Rhapsody. No musical talent? No problem! And if you fancy designing your own sound effects, or more amusingly, recreating the “man with jaw wired shut doing Donald Duck impression into wet paper bag” sampled speech effect featured on the likes of Ghostbusters and International Karate, then you need BeepFX in your life. Yippppppxxxxggghhhxggggrrrgh! 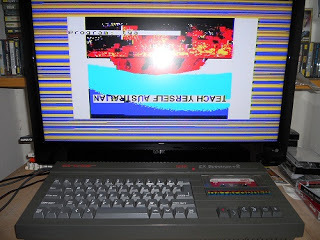 Finally you’ll need a loading screen – so just download a suitable image off the internet,add a title (preferably in Comic Sans or Impact), bung it in ZX-Paintbrush, et voila! Can you tell what it is yet? Note that all of the above utilities (except the emulators) run on Windows. I’m assuming if you’re using something other than Windows that either you know what you’re doing (Linux users) or you can afford to pay someone who does (Mac users).